← 308 "Three Gays of the Condo"
The Simpsons are mimes walking against the wind and sitting on an imaginary couch. "Dude, Where's My Ranch?" 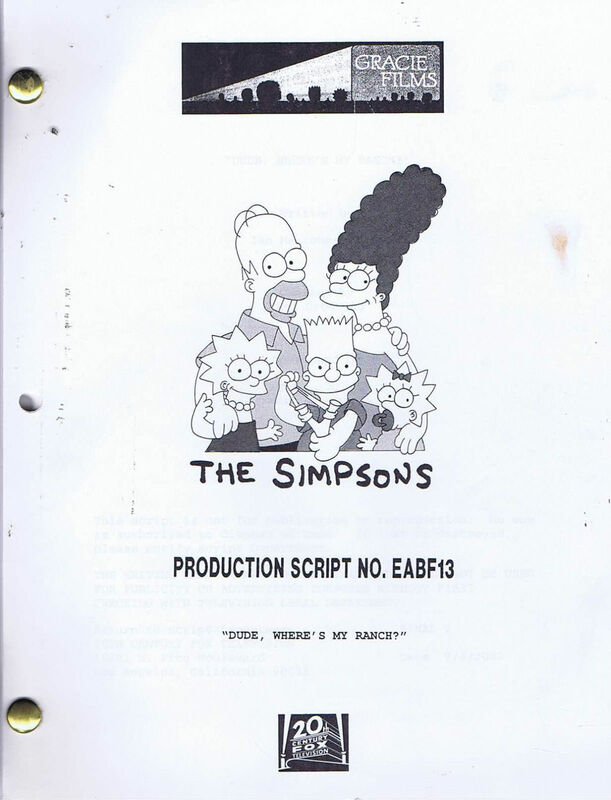 is the eighteenth episode of the Simpsons' fourteenth season. 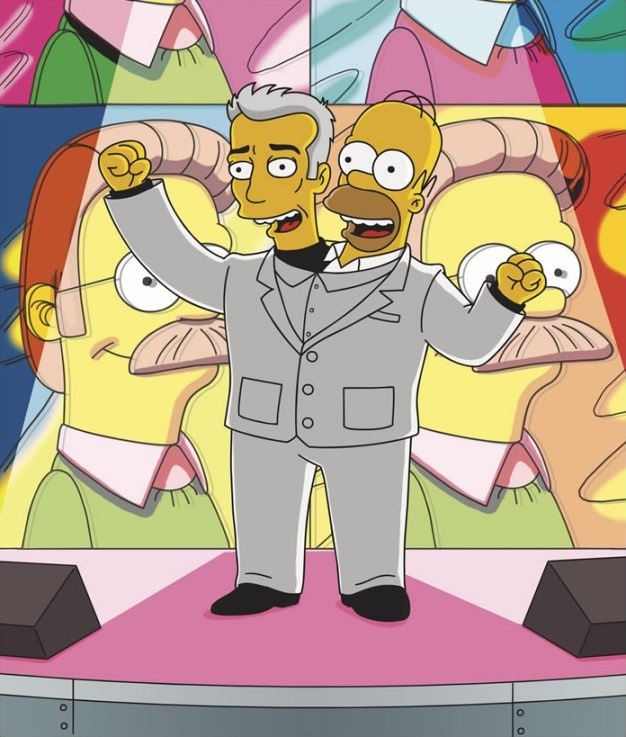 "Homer's song, "Everybody Hates Ned Flanders", becomes a hit in Springfield, but the family leaves Springfield to live a couple of weeks in a ranch to escape Homer's song." When the family does Christmas carols, they sing songs, until they reach the Blue-Haired Lawyer's house. He tells the family that they can't sing Christmas carols, unless they pay a royalty. In response, Homer makes the lyrics for his own Christmas carol. Later, Ned Flanders comes in and tries to help Homer, until Homer kicks him out. Homer finds new inspiration in an anti-Flanders song, Everybody Hates Ned Flanders. He plays the song at Moe's Tavern, and when David Byrne comes in, he likes the song so much, that he wants to produce and record the song. "Everybody Hates Ned Flanders" becomes so popular that even William Shatner does a cover of it. This leads to mass publicity, which annoys the Simpsons, who want to avoid it. They find a brochure for a dude ranch, the Lazy I Ranch, and go there. The family arrives at the Lazy I Ranch, owned by the Rich Texan, who tells Lisa that the ranch was built on cruelty to animals and oppression of indigenous people, which annoys her. It makes her want to leave, until she meets a cowhand, named Luke Stetson, who shares her views on the ranch. The Family meet a man called Cookie who shows them round and sets out some dinner. Homer and Bart also have their own adventure when they meet a tribe of Native Americans who want a dam removed so they can reclaim their land. They are confronted by beavers, but manage to battle them back, destroy the dam, and give the land back to the Native Americans. Meanwhile, Lisa thinks that Luke is off-limits, because she overhears him on the phone, promising a first dance to a girl, named Clara. When Lisa encounters her, she tricks her into going the wrong way. At the dance, Lisa finds out that Clara is Luke's sister. It's up to Lisa, Bart, and some surprising heroes to save Clara. It was a success, although Lisa was disappointed on Bart for destroying the beaver dam. However, when Lisa comes clean, Luke is offended and they separate. Meanwhile Homer asks Marge what has happed since they went into the car. Marge points to a grave to give an example that Cookie had died the previous Night. 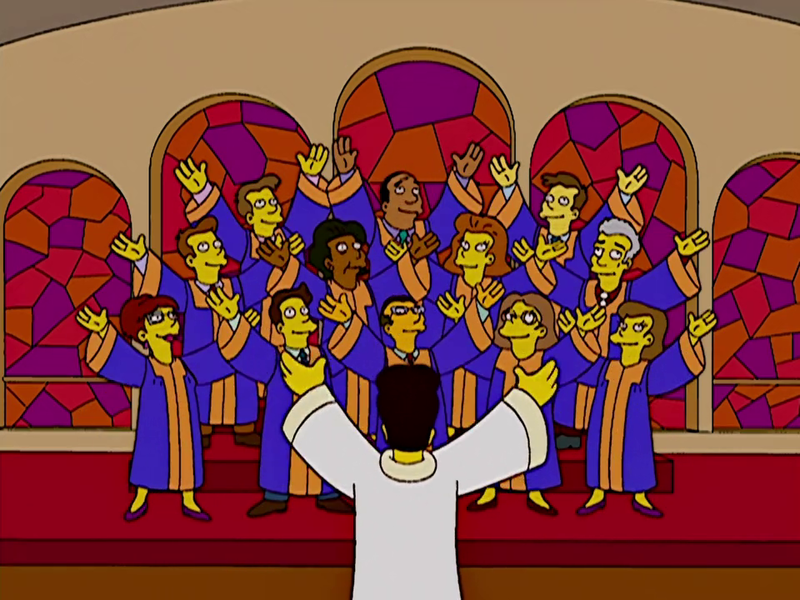 As the Simpsons return to Springfield, they hear a self-deprecating cover version of the Andrea True Connection song "More, More, More", (entitled "Moe, Moe, Moe "), on the radio, sung by Moe and produced by David Byrne (who Moe kidnaps earlier in the episode), and turn around to spend another week at the ranch. Modified on November 26, 2017, at 14:24.